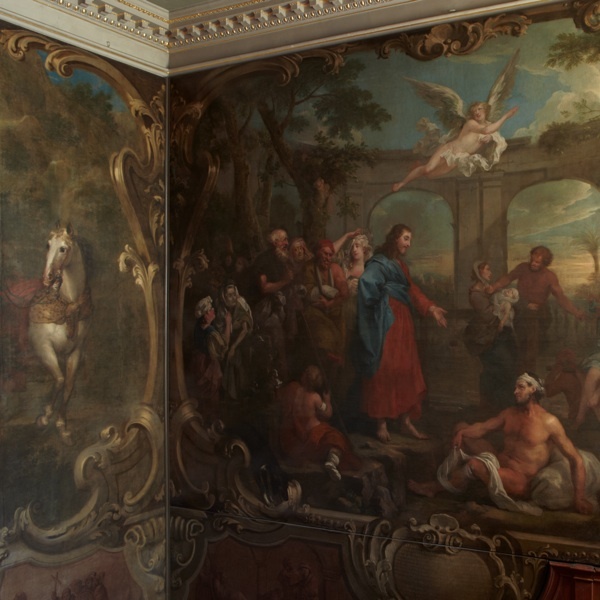 In 1733, when William Hogarth heard that the governors of St Bartholomew’s Hospital in Smithfield were considering commissioning the Venetian artist, Jocopo Amigoni, to paint a mural in the newly constructed North Wing of the hospital, he offered his own services free. Always insecure about his social status, it was a gesture of largesse that made him look good and provided the opportunity for Hogarth to prove that an English artist could excel in the grand historical style. Yet such was the mistaken nature of Hogarth’s ambition that his “Jesus at the Pool of Bethesda” is a curious hybrid at best. 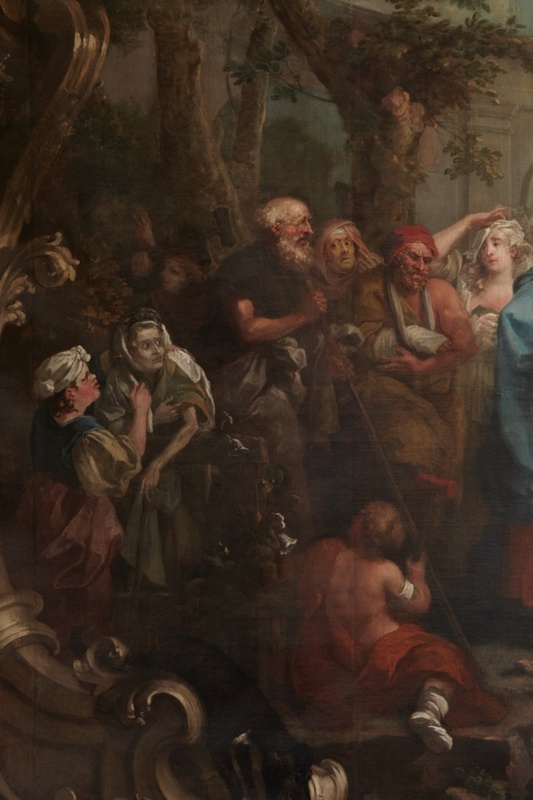 Illustrating Christ healing the sick, each of the figures in the painting illustrate different ailments, a bizarre notion that undermines Hogarth’s aspiration to the sublime classical style and results in a surreal vision of a dystopian arcadia instead. In plain words, it is a mighty piece of kitsch. Let me take you through this gallery of maladies. Be warned, it is not a pretty picture, definitely not something you would choose to look at if you were unwell. In the detail below, on the extreme left we begin with two poor women. Some art historians believe the first represents Cretinism, or Down’s Syndrome to use the contemporary description. Another opinion suggests that the forearms of the two women, side by side, one fat and one thin, illustrate two forms of Consumption or Tuberculosis – whereby the thin woman has Phthisis which causes the body to waste, while the fat woman has the Scrofulous form that causes weight gain. The man with the stick is undeniably Blind. The fourth figure, with the anxious yellowish face may have Jaundice, or alternatively this could represent Melancholia, or Depression as we would call it. The bearded man with the red complexion has Gout, while the sling may be on account of a Sceptic Elbow Joint. The distressed woman beside him has an injured breast which may be Mastitis or an Abscess. Meanwhile, the child on the ground below this group has a curved spine and holds a crutch to indicate Rickets. At the centre of the composition is Christ reaching out to the crippled man at the Pool of Bethesda, as described in the Gospel of St John. The bible tells us this man had been incapacitated by the pool for thirty-eight years, which makes the muscular physique that Hogarth gave him a little far fetched. It owes more to the requirements of the classical style than to veracity, although Hogarth did choose to portray him with a Chronic Leg Ulcer to introduce an element of authenticity to the figure. In the background, a man is accepting a bribe from the servant of the naked woman with the wanton attitude on the right of the composition, this is to push the mother with the sick baby out of the way so that his mistress can get to the healing water of the pool first. The reason for her unscrupulous haste is that she has a Sexually Transmitted Disease, most likely Gonorrhea, indicated by the rashes upon her knees and elbows. Finally, we complete the sorry catalogue with the pitiful man with the swollen abdomen on the extreme right of the canvas, he has Liver Cancer. Hogarth painted “Jesus at the Pool of Bethesda” in his studio in St Martin’s Lane in early 1737 and it was put in place at Bart’s in April. 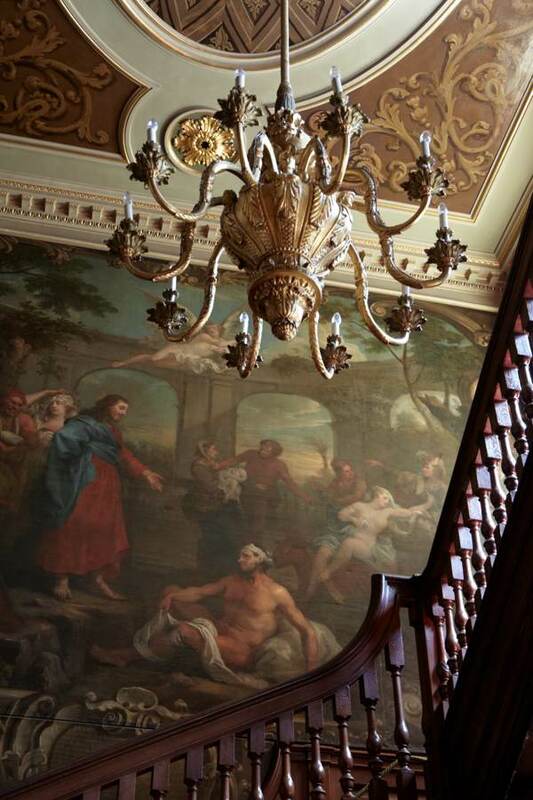 Although it is a huge painting, approximately thirty feet across, its position on the stairwell means that you see just a portion of the picture from the foot of the stairs, then you pass close by it as you ascend the staircase and only achieve a vision of the entire work from the head of the stairs. Let me say that this arrangement does the painting no service. When you see it close up, the broad theatrical brushstrokes of the framing scrolls and of the background, which were painted by George Lambert, scenery painter at Covent Garden, become crudely apparent. Perhaps these ungainly miscalculations in “Jesus at the Pool of Bethesda” were what led Hogarth to paint the companion piece “The Good Samaritan” in situ, from a scaffolding frame. Did he get seduced by the desire for monumentalism while painting the “Jesus at the Pool of Bethesda” in his studio and forget that it would be seen close to, as well as from a distance? Time has done the picture no favours either. With innumerable cleanings and restorations, the canvas has buckled and now daylight prevents you from seeing the painting without reflections, blanking out whole areas of the image. Maybe this was the reason for Hogarth’s instruction that the picture should never be varnished? It was ignored. I cannot avoid the conclusion that “Jesus at the Pool of Bethesda” was a misdirection for Hogarth. It has more bathos than pathos. He aspired to be an artist in the high classical style, yet we love Hogarth for his satires and his portraits. We love his humanity, recording the teeming society that flourished in the filth of eighteenth century London. These pictures speak more of life than any idealised visions of nymphs and swains frolicking in a bucolic paradise. And, even in this, his attempt at a classical composition, Hogarth’s natural sympathy is with the figures at the margins. 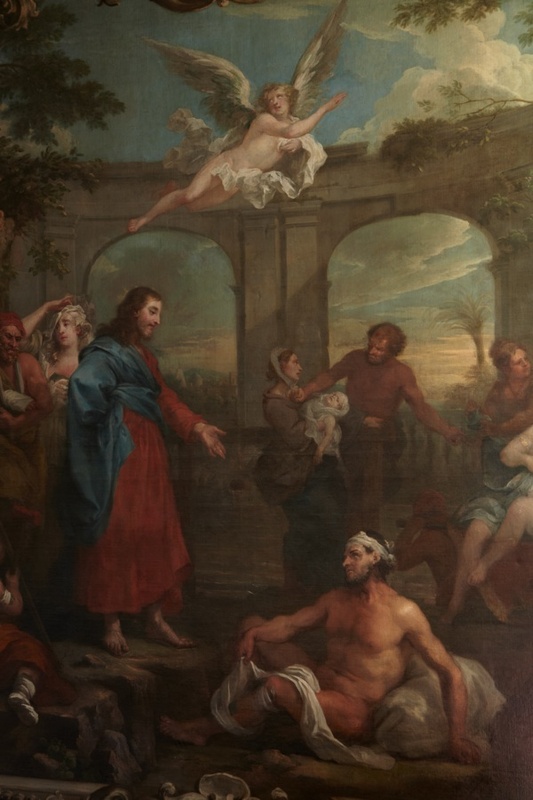 Far from proving that an English artist could excel at the grand historical style,”Jesus at the Pool of Bethesda” illustrates why this mode never suited the native temperament. All the qualities that make this painting interesting, the human drama and pitiful ironies, are out of place in the idealised landscape that suited the tastes of our continental cousins. 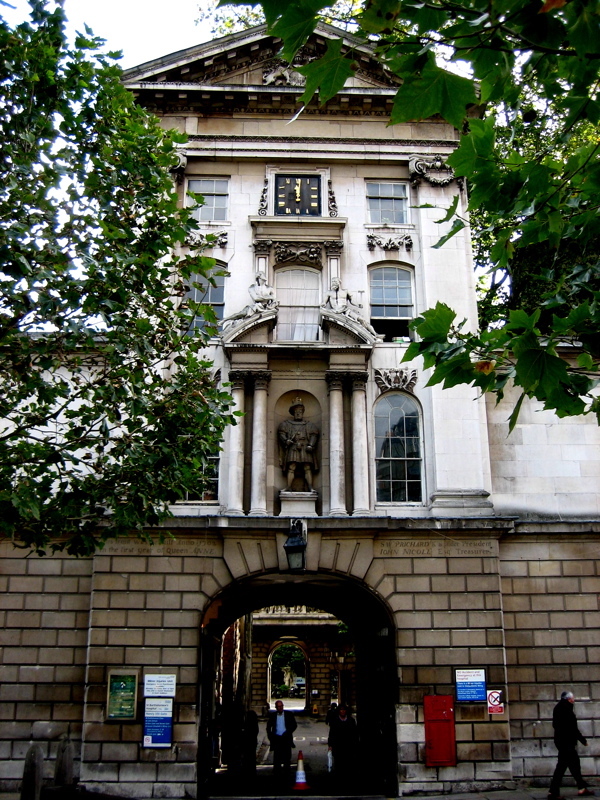 Hogarth was born in Bartholomew Close and baptised around the corner from the hospital at St Bartholomew’s Church. 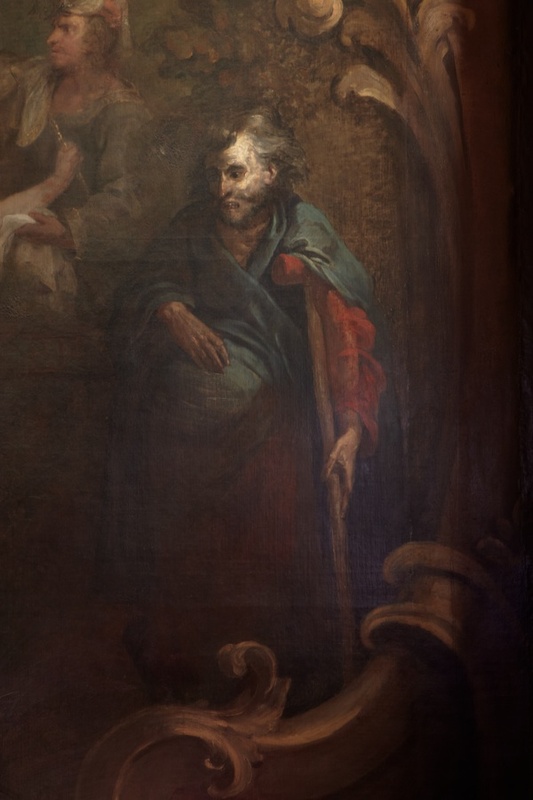 At the time of “Jesus at the Pool of Bethesda,” Hogarth’s mother still lived nearby and she must have been proud to see her son’s painting installed in the fine new hospital buildings. It was symbol of how far he had come. Yet, for obvious reasons, the painting is mostly ignored in books of Hogarth’s work today, so the next time you are in Smithfield, go in and take a look, and savour its bizarre pleasures for yourself. This woman has a sexually transmitted disease. This man has cancer of the liver. 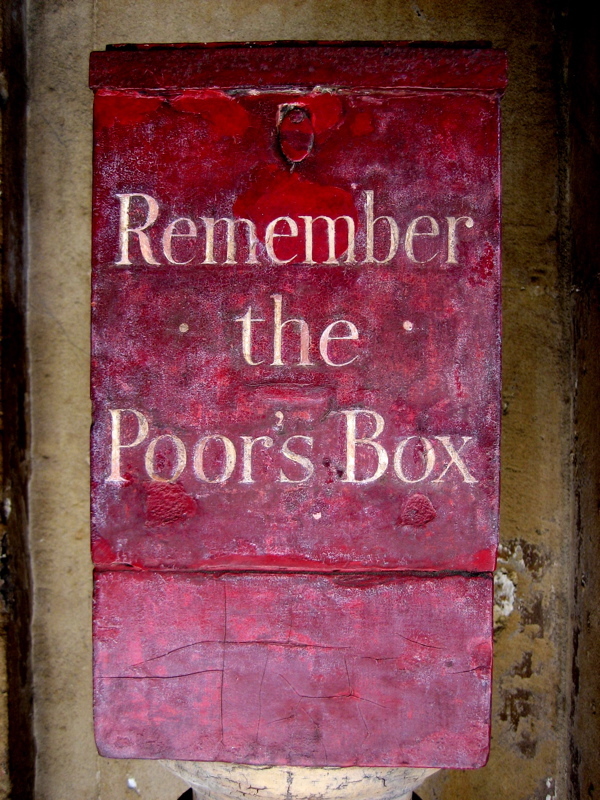 The poor box at the entrance to the North wing. 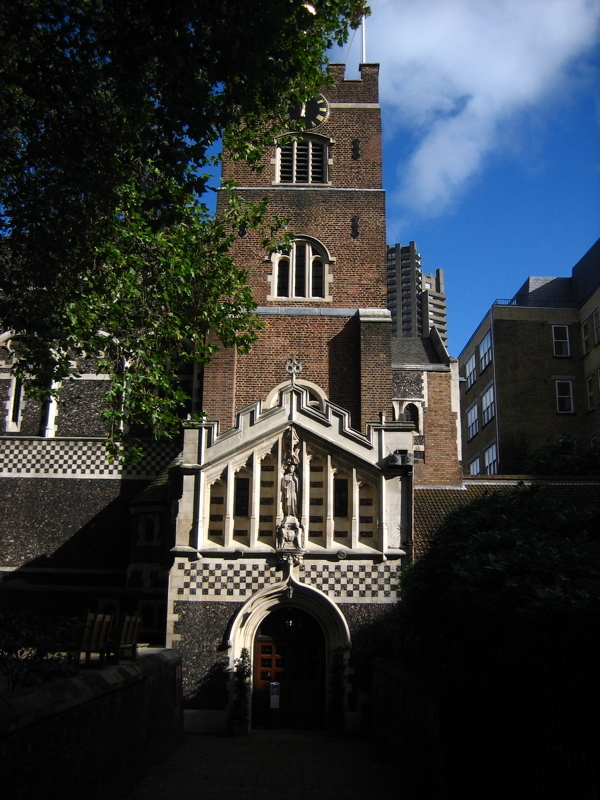 St Batholomew’s Church in Smithfield where William Hogarth was baptised. Excellent critique. Can anyone visit St Batholomew’s? I’d love to have a peek. The sardonic writing style of the critic is every bit as entertaining as the artistry. I was so very fortunate to be a patient in this fantastic hospital. My Surgeon suggested that I go in the Great Hall and have a look at the paintings which are magnificent. Upstairs there is also a list of the many benefactors to St. Bartholomew’s from the beginnings of the hospital. Christ at the Pool of Bethesda is so symbolic of the way that you are treated at the hospital and the love and care that you receive there. I agree with Sara Jones. My old school building inside the church, Sir John Bengimen,the poet was often seen,going past our playground at the side of the church,where he lived,in the 50s, we also slept on the tomb stones in the church garden in the summer. I entered this world successfully thanks to Start Bart’s Hospital back in the mid 50s. I have often returned to the exciting Smithfield area, my father working in the market for many years. I have enjoyed the church and most of the pubs but never returned to the hospital. I look forward to doing so soon enthused by your wonderful article, thank you.